When you’ve added products and services to an opportunity, it’s easy to make changes. You can make changes inline, or use the edit opportunity item screen to make more detailed changes. Changes to the charge total are calculated immediately. To edit a product in more detail, click the blue arrow to the right of it and choose Edit from the menu. On the edit screen, make changes to the quantity, chargeable days (if enabled for the opportunity), description, price, and discount. Working on a draft or open quotation? Toggle the “Sub-rent stock” or “Sub-contract service” slider to YES to make this a sub-rent or sub-contract. Surcharges let you automatically apply a percentage or fixed fee to products added to an opportunity. 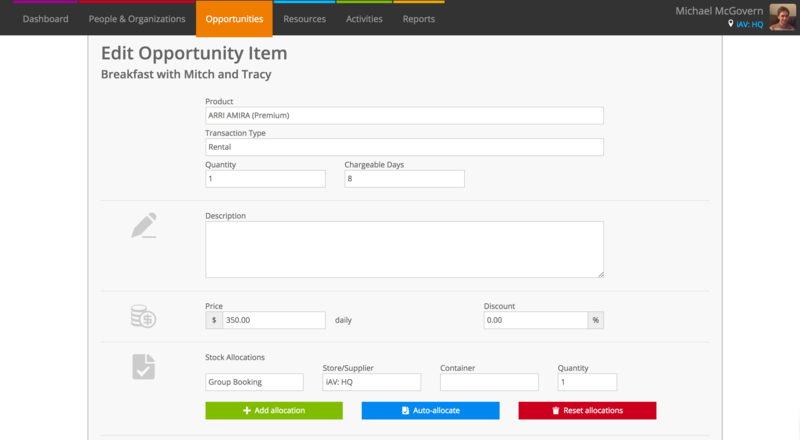 If enabled for this opportunity, you can modify surcharges for the opportunity item at the bottom of this screen. If your opportunity is an order, provisional quotation, or reserved quotation, add and modify allocations in the Stock Allocations section. This is an advanced way to set your allocations, especially handy for cases when you will need to have a mix of sub-rent products and assets from your own stock. From here, you may also set costs for sub-rent products and services.